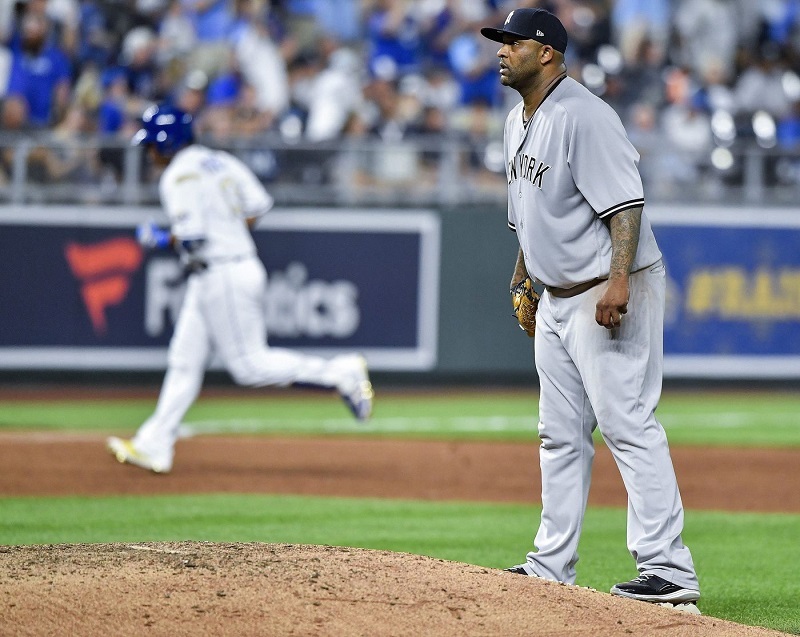 The Yankees arrived in Kansas City a travel-weary and rusty team, having endured a nightmarish trip out of D.C. and a stretch of four straight days without completing a game. And, well, the Yankees predictably played like a travel-weary and rusty team on Friday night in their 5-2 loss to a Royals team that entered the series with the second-worst record in baseball. It’s actually pretty rare that the Yankees would lose to a team as bad as the Royals — who were 13-30 (.302) before Friday — this late into the season. It was only the second time in the last eight years (since 2011) that the Yankees were beaten by a team with a win percentage of .302 or worse at least 40 games into the schedule. The other instance was a 7-4 loss to a 20-48 Twins team on June 19, 2016. While there were multiple cold bats in the lineup on Friday, none have been as deep in the freezer as Didi Gregorius. 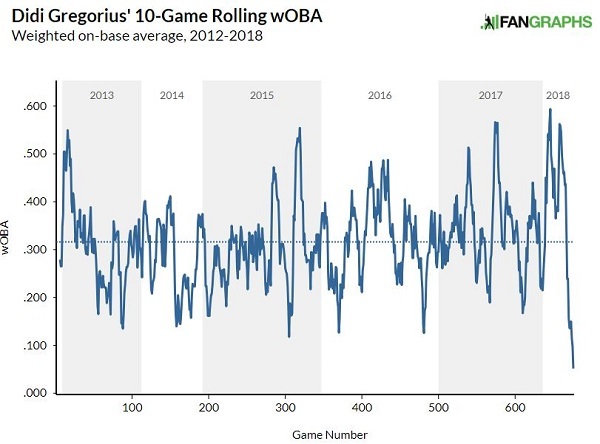 After going 0-for-4, this became officially the worst 10-game slump of his career, no matter what offensive metric you use. In the 10 games from May 4-May 18, he had a .024/.089/.024 slashline, .113 OPS, .051 wOBA and -83 wRC+. All of those stats are the worst he’s ever had in any 10-game stretch in his career. Yikes! 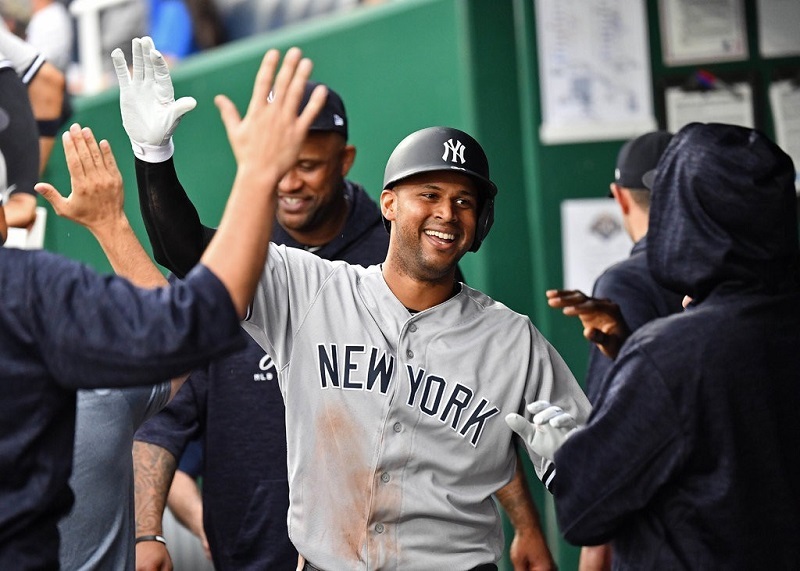 The Yankees rebounded from one of their most sluggish efforts of the season with a typical Bronx Bomber-style offensive explosion, belting five homers en route to an 8-3 win. Even before they took the field, the Yankees made history. All nine guys in the starting lineup were 28 years old or younger, the first time the Yankees have done that since Sept. 26, 1970, and the first time ever this early into the season (43rd game) they’ve had a starting nine with every guy under age 29. First Yankee since Mickey Mantle in 1958 with multiple inside-the-park homers in a season, and the fifth to do it in the last 75 years. The others, besides Mantle, are Hank Bauer (1956), Gene Woodling (1950) and Snuffy Stirnweiss (1944). The second Yankee to hit an inside-the-parker at Kauffman Stadium, along with Derek Jeter (Aug. 2, 1996). The third player in franchise history with inside-the-park homers from both sides of the plate in the same season. Lee Maggee (1916) and John Anderson (1904) are the others. First Yankee since Ben Chapman in 1930 to hit two inside-the-park homers on the road in a season. Gleyber Torres was the next Bronx Bomber to go deep, breaking a 2-2 tie in the fourth inning with a monster three-run shot to left field, his first career homer on the road. That gave him 15 career RBI, making him the youngest Yankee (21 years, 157 days old) to that milestone that since a 19-year-old rookie named Mickey Mantle in 1951. Although this was just his fourth homer as big leaguer, he definitely hasn’t produced any cheapies or boring blasts so far. All four have gone at least 407 feet, and three of the four have been tie-breaking shots in games the Yankees eventually won. Gary Sanchez extended the lead with a homer in the seventh and another in the ninth. He now has 10 career multi-homer games, just the fourth Yankee to have double-digit multi-homer games before age 26. The guys he’s chasing? Joe DiMaggio (17), Mickey Mantle (14) and Lou Gehrig (13). 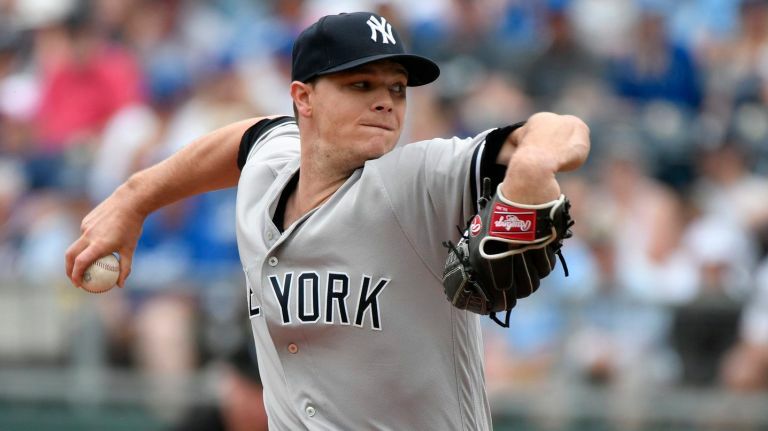 The Yankees won their eighth straight series thanks to a 10-1 rout on Sunday, as Sonny Gray delivered an absolute gem and the Yankee bats produced another explosive power-hitting show in Kansas City. It’s the first time they’ve won eight series in a row since a nine-series streak in July/August 1998. For the second straight day the Yankees were spraying balls deep into the outfield gaps and over the fences, crushing four homers, two doubles and two triples among their 14 hits. And with that combo, the entire team earns our Obscure Yankeemetric of the Series: This is just the second time in the last 50 seasons that they’ve piled up at least four homers, multiple doubles and multiple triples in a game. The other was a wild 15-13 win over the Rangers in Texas on May 6, 1998. The big bopper on Sunday was Tyler Austin, who belted two homers for his second career multi-homer game (both this season), including a mammoth 440-foot blast in the fourth inning that is the longest of his career. Combined with his 405-foot shot in the ninth, he now has six 400-plus-foot homers this season, tying Gary Sanchez and Giancarlo Stanton for the team lead. Miguel Andujar had a day at the plate, too, falling a double short of the cycle. The only other Yankee third baseman since 2000 with a home run and a triple in the same game was Alex Rodriguez on September 15, 2005 at Tampa Bay. The best highlight of the game, however, was the brilliant outing by Gray. He retired the first 14 Kansas City batters and tossed eight sparkling innings, allowing just one run on four hits. He was sharp, efficient and in total control nearly the entire afternoon, and most importantly, pitched aggressively early in the count. He threw first-pitch strikes to 22 of 29 batters (75.9%), his best rate in any game as a Yankee. Gray entered Friday with a career-low 53.2 percent first-pitch strike rate, 10th-worst in MLB. How important is strike one for Gray?